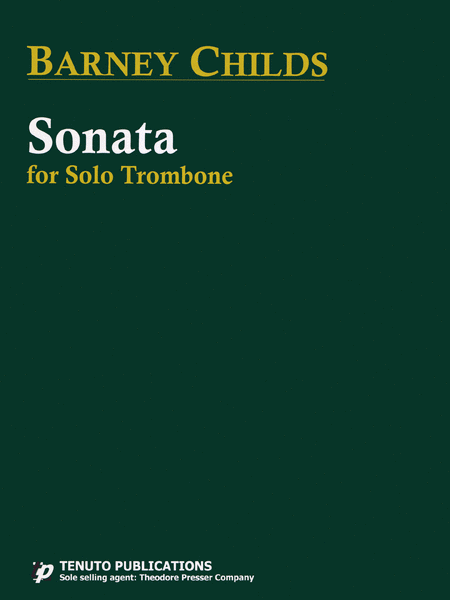 Barney Childs wrote the Sonata for Solo Trombone in 1962. A champion of avant-garde music, Childs was deeply involved in the genre, having studied composition with, among others, Elliot Carter, serving as an editor of Perspectives of New Music, and even running a recording company largely dedicated to avant-garde works, Advance Recordings. Many of his works incorporate indeterminacy, where some performance elements are left up to the performer. This Sonata is clearly in the avant-garde category, and serves to explore some of the capabilities of the trombone. While challenging, including a range of BB-flat up to e2, this work is by no means prohibitively virtuosic, and could be used with advancing college students as an introduction to some basic avant-garde elements, such as indeterminacy and microtones. It is also well-suited for professional performance. Each movement focuses on a different aspect of indeterminacy. The first movement, aptly titled “Recitative” leaves ambiguous spaces and pauses up to the performer, as well as un-metered passages and instructions such as “play these notes in order with any rhythm values and dynamics you wish.” The second movement switches frequently between swing and “legit” passages, almost like an argument between jazz and classical performers. This movement also features quarter-tones, usually played in close proximity to the centered pitch which helps them more accurately be discerned. The final movement makes reference to the rondo form, but has different families of melodic events grouped together with a set of rules that determine the flow of the movement, while leaving a number of choices up to the performer. It is similar to a choose-your-own-adventure story, with the performer selecting the order of passages to perform on the spot, according to the rules. In the true spirit of indeterminacy, this movement can be as long as the performer wishes. Published 50 years after the original, this current edition contains the original piece, but in a much clearer, better spaced, and easier to read format, a welcome improvement.